A significant number of marketers are seeing the value in influencer marketing, at least according to a study from marketing firm WhoSay. 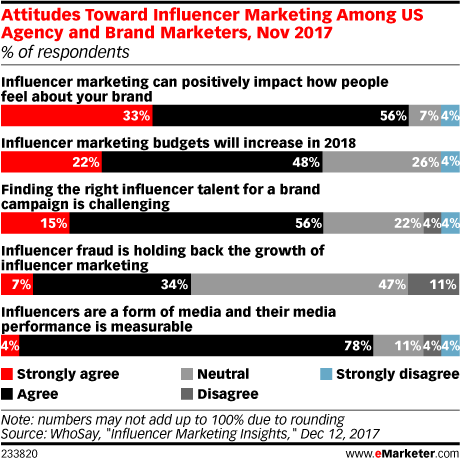 Some 70% of US agency and brand marketers said they “agree” or “strongly agree” that influencer marketing budgets will increase in 2018. A large share of respondents (89%) believe this form of marketing can positively impact how people feel about a brand. And almost as many consider influencers to be a genuine form of media with an impact that can be measured. So, how exactly are marketers measuring the success of these campaigns? The biggest metric they rely on is press coverage. 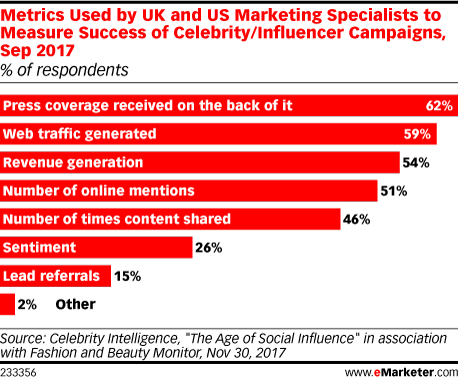 Six in 10 look at press mentions as a way to determine whether their influencer campaigns paid off, according to September 2017 polling conducted by Celebrity Intelligence. Revenues generated as a result of these campaigns is more difficult to measure. Only 54% of marketing specialists polled said they use revenue generation as a way to gauge whether the campaign was successful. As marketers continue to deploy influencer marketing campaigns to connect with audiences, the biggest challenge they seem to come across is actually finding influencers. For example, the Celebrity Intelligence study found that roughly half of marketing specialists find it difficult to identify the right talent. The second biggest hurdle is engaging influencers in conversation. Only 21% of respondents said they take issue with granting influencers the creative freedom they desire. This indicates that most marketers are willing to put their trust in the talent they hire.